This is the first in a series of articles regarding fasteners. Over the coming months we will discuss bolts, screws, nuts, washers, specialty fasteners and their applications. This month our discussion turns to bolts and screws. 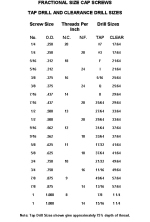 The purpose of this article is to provide a cursory overview of the common nomenclature, grades and classes, identification of both SAE Inch and ISO / DIN Metric bolts and screws and a short overview of screw threads. Screw: A fastener designed to clamp two components together by the fastener mating to a threaded hole or other preformed hole. The first component having a clearance hole through it for passage of the screw and the second component having a threaded hole in it to accept the screw and being tightened or released by torque applied to the head of the screw. A commonly misidentified item is a Cylinder Head Bolt. Oddly enough in that example, the term Head Bolt is so commonly used that it has now become the vernacular, but the technical fact is that it is a Hex Head Cap Screw. Bolt: A fastener designed to clamp two components together by the fastener passing through the components and mating with a corresponding nut to hold the assembly together. The entire set of components has a clearance hole through them to allow passage of the bolt. The bolt is then secured with a nut and torqued in place to retain the assembly. Either the bolt or the nut can be retained statically during assembly to apply clamping pressure to the assembly. 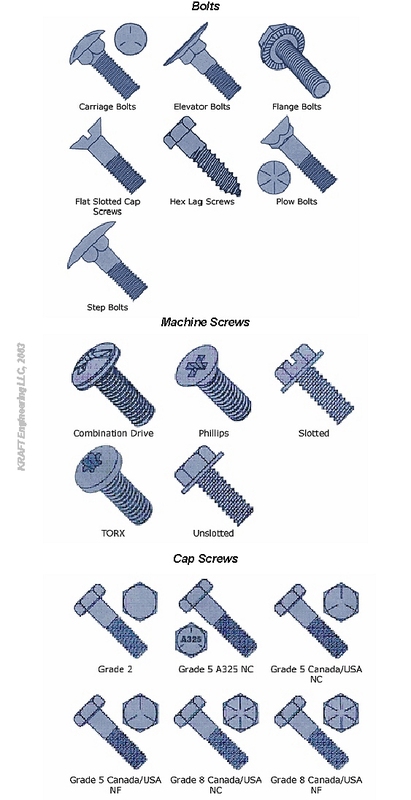 A diagram is provided to help determine typical bolt and screw configurations. 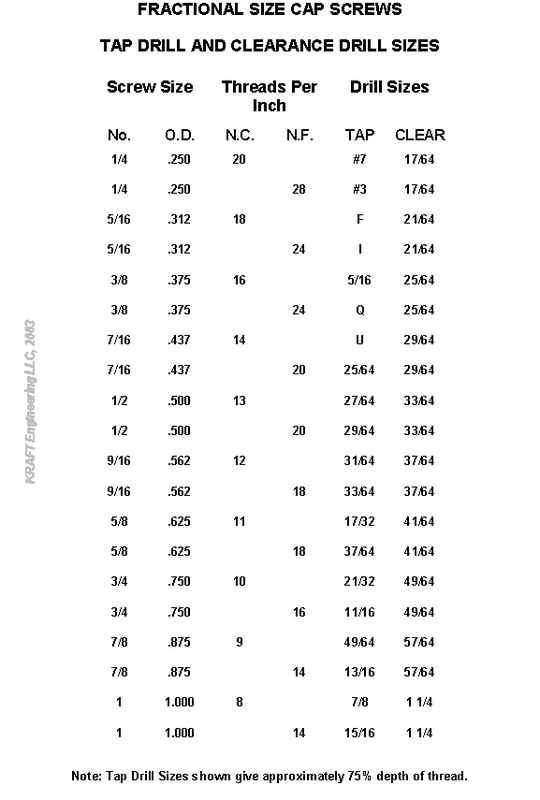 Understanding the nomenclature of a thread is important in determining which type of fastener you are going to purchase. 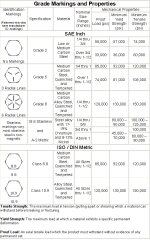 Determining factors are Major Diameter (either expressed in a number or fractional size) and threads per inch / MM. 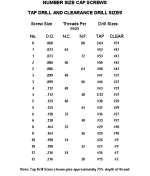 For brevity, well discuss only common helical V threads since it the most common thread form. Simply, a V thread is a form in the shape of a "V" that forms an angle of 60 degrees to the complimenting surface of the thread form. For a good visual aid in understanding this concept, go to your store of fasteners in your garage, pick out the largest bolt / screw you have and examine the profile of the thread. You will see that it does indeed have the basic shape of a V, likely with a flat surface at the top (crest) and the bottom (root) of the thread form. You will also notice that it spirals (helix). These are the factors that make an external fastener thread, when mated to an internal thread, an effective means of fastening two objects together. Major Diameter: The diameter of the major size of the cylinder. i.e. a thread is nominally .250. 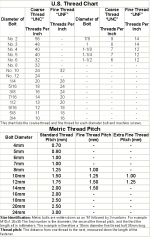 Pitch Diameter: The functional diameter of all of the thread form dynamics, including perfect pitch, lead and flank angles, and having a specified length of engagement. 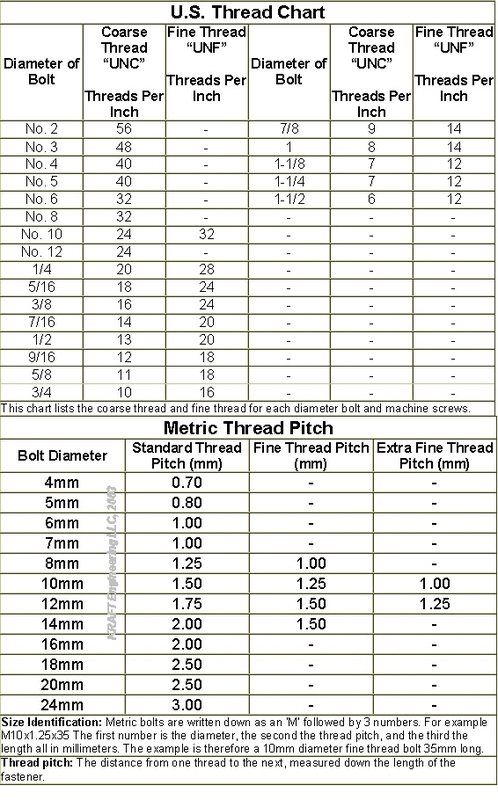 Thread per Inch / MM: The cumulative number of threads per unit of measure, i.e. 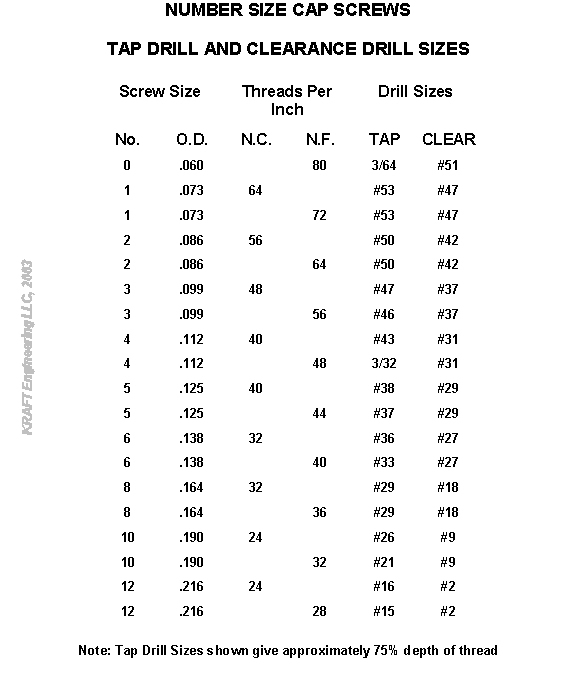 a .375 X 24 thread has 24 threads per inch of screw thread. 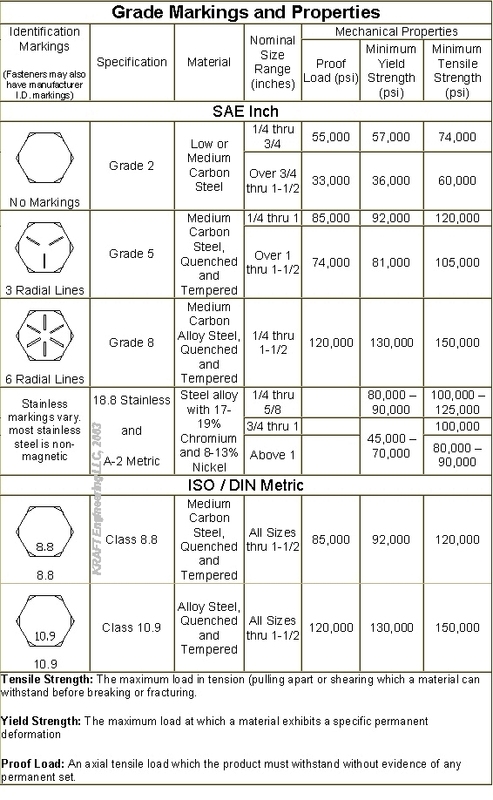 As a guide, see the chart depicting common SAE Inch and ISO / DIN Metric Sizes. When we get to the forthcoming article regarding applications, we will delve more into why these different types, shapes, configurations and grades of fasteners are important and where they should and should not be used on our automotive based projects. Keep your bookmarks tuned to this section! New York, NY 10016-4078 U.S.A.
Copperstate Bolt and Nut Co.